With a sweet, sticky umami flavor this glaze makes anything addictive. 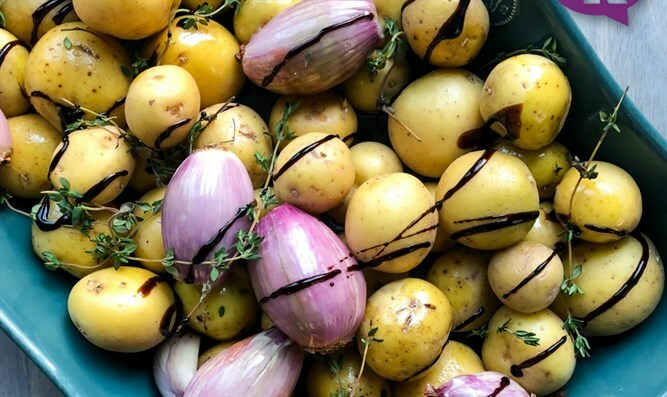 Toss the olive oil with the shallots and potatoes and place on a large cooking sheet or baking pan. Sprinkle the fresh thyme over the potatoes and drizzle the balsamic glaze over as well. Toss again to coat. Sprinkle with salt and pepper and bake uncovered for 40 minutes. Halfway through cooking toss the potatoes to ensure even browning. Bake until fork tender and crispy golden brown. Remove from oven and sprinkle with a dash more salt and pepper and drizzle with balsamic glaze as desired. Serve piping hot. Can be prepared and reheated up to three days in advance. Store covered in the fridge and reheat uncovered till warmed through. Don’t limit yourself to potatoes! Try any root vegetable here!